Check out the latest Yamana Gold earnings call transcript. Yamana Gold (NYSE:AUY) was hugely outperforming rival Kinross Gold until mid-2018 before it started losing ground rapidly, so much so that both stocks are now among the worst performing mid-cap gold mining stocks for 2018 with similar 25% drops in value each. Investors in Yamana, though, would've been deeper in the red had the stock not gained nearly 11% in December. That raises the question: Is this a dead cat bounce or is Yamana Gold a buy now? While rising gold prices can largely be credited for the recent recovery in Yamana shares, there's a fair chance rewards could outweigh risks in 2019 and beyond and drive the stock higher. Here's why. 2018 was a significant year for Yamana as it successfully brought its seventh mine, Cerro Moro in Argentina, on line. Thanks largely to a first full quarter of production from Cerro Moro in Q3, Yamana's total gold production from existing mines (excluding Gualcamayo that it recently sold off) jumped 10% to 670,426 ounces during the nine months ended Sept. 30, 2018. Even better, Yamana's byproduct all-in-sustaining cost (AISC) per ounce produced dropped to $712 per ounce of gold from $758 per ounce during the period. Yamana also recently upgraded its fiscal 2018 gold production guidance by 20,000 ounces to 920,000. Comparatively, rivals like Kinross Gold are struggling with declining production and rising costs. That incremental production failed to show up on Yamana's bottom line, though, for a couple of reasons. First, Yamana had a lower quantity of consolidated gold to sell this year in the absence of contribution from its subsidiary, Brio Gold, which it spun off in 2017. Second, impairment charges on the sale of Brio Gold and Gualcamayo and other one-time items wiped out nearly $309 million, or $0.33 per share, from Yamana's profits during the nine-month period, resulting in a steep loss of $229.1 million. That's one big reason why investors haven't been happy with Yamana and sent the stock tumbling. Some investors are also worried about the humongous total debt worth $1.78 billion that Yamana carried as of Sept. 30, 2018. The bulk of the debt, however, is long term, and the nearest maturing fixed-rate debt, worth $84 million, isn't due for payment before 2020. By then, Yamana's gold equivalent ounce production is expected to have grown at a compound annual rate of 8.8% to hit 1.15 million ounces in fiscal 2020, bringing down its costs as well. Moreover, with major expansion projects behind it, Yamana should have more cash flows in hand to service debt or even pay dividends in 2019 and beyond. Just so you know, Yamana continues to generate strong operating cash flows. AUY Cash from Operations (TTM) data by YCharts. In short, Yamana has solid production and cash flow growth visibility. There are some risks that investors in the company need to be wary of, however. The biggest impediment to Yamana's earnings growth in the near term, perhaps, would be the recent export tax through 2020 proposed by Argentina. As Yamana CEO Daniel Racine put it in a press release, "While the Company's favorable positioning relative to production and costs bodes well for the near and medium term, Argentina's export tax has the potential to offset a portion of these benefits." While Yamana Gold accrued $2.5 million as tax expense in the third quarter, management is challenging the tax order in Argentina, and in the absence of a favorable outcome, will likely use a "tax stability" clause that entitles it to recover taxes it may have to pay in excess of the limit fixed at the time of feasibility studies for Cerro Moro in pursuant to laws. That should mitigate the impact of any taxes on Yamana's bottom line, though there's no denying that additional taxes, even if small, will eat into its profits. This unexpected development makes it even more important for the company to ensure that Cerro Moro scales up as planned, as that mine largely holds the key to Yamana's growth in coming years. 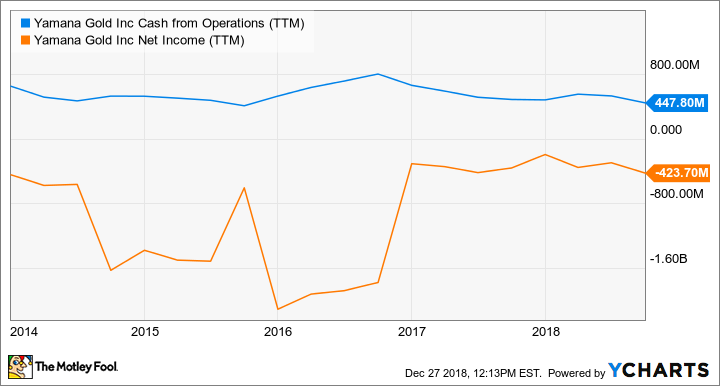 Expected cash flows from the mine should not help Yamana boost productivity but also provide a buffer for interest payments especially if the company is unable to refinance long-term debt on favorable terms in a rising interest rate environment. Given that Yamana Gold will likely end FY 2018 with a net loss, FY 2019 should comparatively be a stronger earnings year unless gold prices tumble or the miner has to take big tax hits. Cash flows, however, matter more than earnings for a mining company, and Yamana Gold is positioned well on that front. In fact, for its cash flow potential in the near term, Yamana stock looks cheap at five times operating cash flow and could shine brighter in 2019 and beyond.